Lata Stefano, D.D.S of Stefano Dental of Sandusky, Ohio kicks off National Children’s Dental Health Month by collecting stuffed animals for kids in crisis through March 1, 2019. The stuffed animals will be donated to the local Sandusky Police and Fire Departments to pass out to children going through crisis. 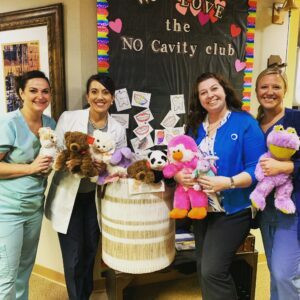 Participants will be entered into a raffle to win a children’s Sonicare toothbrush; one raffle ticket is given per stuffed animal. To donate stuffed animals, stop by Stefano Dental at 1617 W. Bogart Road in Sandusky, Ohio. This fundraiser was so successful last year, that Dr. Stefano knew she had to do it again this year! There's no better way to give a child a smile, than to give them a cuddly stuffed animal, especially in a time of uncertainty or crisis. Many children experience trauma and stress during a fire or emergency, and these stuffed animals are exactly what some of these kids need to offer them comfort and assurance during this conflicted time. Whether you have one stuffed animal to donate or many---any donation can make a difference with one child. Children's Dental Health Month is a great time to focus not just on kids' dental health, but kids overall emotional health. One toy, one stuffed animal can make the difference for a child feeling scared and a child feeling protected and safe. You don't have to be a patient of Stefano Dental to donate. Just stop by our offices in Perkins Township, Ohio during office hours, and drop off your stuffed animals.